The tall, willowy plant with the long, narrow leaves waved around in the breeze, behind the rows of neat balls of mini-basil. Wondering what it was, I stretched out a hand and rubbed a leaf. Immediately, my senses were filled with a lemony, refined aroma. It was like a lemon scented geranium, but not quite. It was like lemon balm, but not as minty. The sunburned, kindly faced owner of the market stall said that it was verveine. He went into a long explanation, of which I understood perhaps half, about how to care for the plant. I nodded ernestly and took notes. 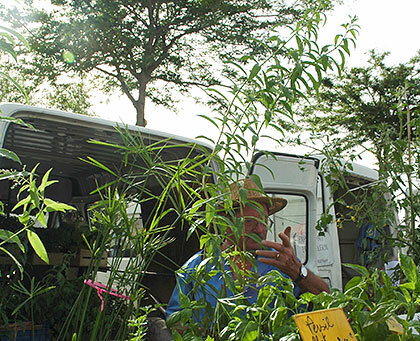 The vendor almost hidden by the verveine plant. I wasn't sure what verveine was, but I knew I had to have this plant. It was so tall that we had to stick the branches out of the rear window of the car lest we broke them. We carried it home like that, all the way from Provence to Zürich. Once I got home I looked up verveine. It was lemon verbena. I'd read about lemon verbena but never encountered it before. Lemon balm, called zitronenmelisse, grows wild in our unkempt garden, but this lemon verbena had a much more intense, citrusy, sunny aroma. 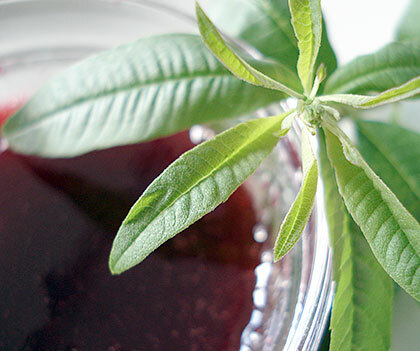 (As it turns out, lemon verbena is also called verveine here in the German speaking part of Switzerland.) I planted it in a sheltered corner of one of the flower beds right next to the house, together with a couple of other herb plants purchased at the Velleron market. It was my little corner of Provence. In July, the night before we were due to leave for a working trip to New York, there was a tremendous thunderstorm - the kind we get a couple of times a summer here, reminding us that we are after all surrounded by mountain ranges. In the morning all was calm again. As we hauled our bags from the front door to the taxi, I stopped in dismay in front of my precious lemon verbena. The strong wind had completely stripped all the leaves from the plant. All that were left were some forlorn looking light brown stems. "I have to get a replacement", I muttered over and over in the taxi. "As soon as we get back from New York..."
Two weeks later we arrived back home. After hauling the now much heavier bags to the front door, I went to inspect my little herb patch. Those slender stems that had looked dead when I left, were now sprouting tiny little new leaves again! I could have hugged that plant. Its ancestors had survived many seasons of the Mistral, so why wouldn't this sturdy little plant survive a thunderstorm? Now in late August, the verbena has enough leaves on it that I can clip some off to use in cooking. I thought of adding the marvelous aroma to this summer berry jelly. This kind of jelly, called gelée or schlée, is a very popular way to process the berries of summer here. It's made from a mixture of summer berries, whatever is available - I used raspberries, red currants, and a few blackberries, which give it a beautiful dark claret-red color. Fresh berries are better of course, but you can even use frozen berries. The addition of the verbena adds a very intriguing, lemony-zesty, "what is that?" quality to the jelly. Making preserves from summer fruit is like capturing a bit of the soul of summer, and this certainly qualifies in that respect. I have given an amount that is enough to fill a couple of jars, so you don't necessarily have to go through the whole canning/sterilization process - you can keep it covered in the refrigerator. You can of course double or triple the amount if you would like to have a neat row of dark red jelly jars. It's wonderful on bread or crackers or scones, alone or with butter or cream cheese, and is perfect on plain yogurt or vanilla ice cream. [Edit:] I forgot to add a couple of things asked for by Nicky. Firstly, my favorite preserving books are: Mes Confitures, by master preserve maker Christine Ferber. I also have a book called Jams, Preserves and Edible Gifts, published by the National Trust in the U.K. I believe that the British make wonderful jams and preserves, so this book, filled with historical and traditional recipes as well as modern ones like raspberry vinegar, is one I turn to a lot. For packaging - I usually don't do much to jars I give away, but this is a quick and easy special touch to add. Just make a tiny photograph of the contents of the jar, with text above or below it indicating the contents. Print this onto a nice, fairly sturdy paper on your inkjet printer, and cut it so that it falls on the right side of a rectangle. Fold it in half to make a tiny gift card. Poke a hole in the left upper corner, and thread through some hairband elastic. Cover the top of the jar with a piece of fabric cut with pinking shears, or any scissors if fraying doesn't bother you. Secure the elastic over the lid. You can write a personal message inside the gift card. The fabric used is an inexpensive sacking cloth. The font is Apple Chancery. 500g / 1 lb plus about 2 oz. berries - any or all of the following: raspberries, tayberries, blackberries, red currants. I used a mixture of about 70% raspberries, 25% red currants, and 5% blackberries, harvested from the garden. Wash and sort the berries. If you are using red currants, carefully pick off all the stems. Put the berries and sugar into the pan. Mix and let it macerate for about half an hour. In the meantime, put the plate into the refrigerator to make it very cold. Mix in the pectin. Turn on the heat, and bring to a boil. Lower the heat to low, and cook for at least 45 minutes, stirring up the bottom periodically to keep from burning. Scoop off the scum that forms on the top. For the last 10 minutes of cooking, drop in the lemon verbena. Drop a bit of the jammy liquid onto the cold plate. If it forms a skin almost immediately, it's done. Fish out the lemon verbena. Pass the jammy mixture a ladleful at a time through a time through a sieve or strainer, taking out all the seeds. Can using your favorite canning method. If you will be using the method I described in my recipe for apricot preserves, heat up the strained jelly to boiling point again before proceeding. In this recipe I have used pectin, which is a natural jellifiant. Berries in general don't have much pectin, and it's needed in this case to make it 'jell' enough. You may also be able to find something called sugar for jam making, which has pectin already mixed in. My version (with 1 teaspoon per 500g fruit) results in a fairly runny jelly, which is great for using on yogurt and ice cream, but if you prefer a firmer jelly you will need more pectin. Follow the package directions. If you don't mind the seeds, especially if you don't use red currants which have rather large seeds, you can skip the straining step. In that case you will have a jam rather than a jelly. 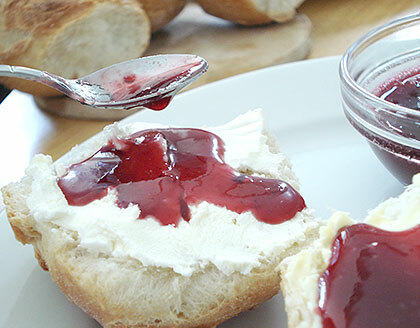 [Update:] The jam and jelly roundup is now up on delicious.days. Lots of delicious sounding recipes to try! Submitted by maki on 2006-08-25 16:59. This jam looks delicious! I love lemon verbena. My plant didn't last very long here in Florida, but it was lovely while it did. I liked using it to flavor whipped cream. Wow, I thought verbena was a warmth loving plant that would like Florida - I guess I'm wrong! Flavoring cream with verbena sounds lovely. Why not use something less toxic than White Sugar? I've been using the ecuadoran brown sugar widely available at naturkost shops in germany. Thank you for explaining so lovingly what Verveine is. I wonder if it would grow in Colorado. I bought a box of Verveine tea bags once, but I would rather grow the plant myself, so I could use it in other ways. Marika, I don't see why verveine (lemon verbena) wouldn't grow in Colorado, since it grows very well here in Switzerland. It's thriving even more this year here. Give it a try - the fresh kind is so much more fragrant than the dry! Thank you for your quick reply Maki. I called up one of the local nurseries and they had one plant left, so now I have a verveine also!!! I probably will bring it in for the winter. By the way my daughter's name is Moki. I just made this yesterday with lemon verbena that we received in out crop share allottment this week. We made it with raspberries, blackberries and strawberries, and of course the verbena- and it worked! 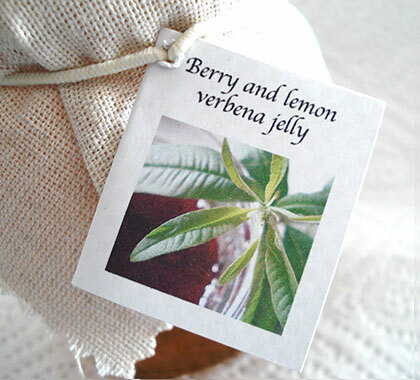 The verbena adds such an interesting, and lovely essence to the jam. Thank you. Great recipe! Do you think I can substitute the verbena with orange balm or lemon balm? I have both already growing in my garden.